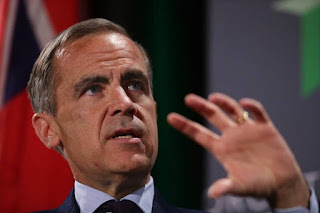 Carney's tenure at the helm of the Bank of England became a distraction. Ahead of this week's MPC meeting and Quarterly Inflation Report, he addressed the issue. Several press reports over the weekend had him leaving post haste. Ostensibly, he lost the support of the government. Prime Minister May was critical about the social impact of low interest rates. Several Tory MPs who favored leaving the EU argued Carney was too biased in favor of the Remain camp. Yet rather than resign, Carney extended his term. When he first took the post, he offered to stay for five years. That would take him into 2018. He now says he will state until mid-2019. He specifically cited the desire to take his term beyond the expected Article 50 process to help ensure an orderly transition in the UK's relationship with Europe. Carney's decision does not change anything but does take away some downside scenarios. The MPC meeting and the Quarterly Inflation report and all three PMIs remain tap for this week. On balance, we expect the MPC to keep its last rate cut, which would be 10-15 bp, in its pocket for a while longer. It is not needed at the moment, and it would be too small to have much impact in any event. As we have noted previously, speculators in the futures market have been trying to pick a bottom in sterling for the last few weeks. The euro reached its best level against sterling (GBP0.9047) in two weeks earlier today and reversed lower on Carney's news. It found support near GBP0.8960, ahead of the 20-day moving average (~GBP0.8940). It has not closed below this average since mid-September. The pre-weekend low was near GBP0.8945. A break of that area could signal a move initially toward GBP0.8885. The idea that Carney would quit because he was criticized is wide of the mark. If the concern was the independence of the central bank, institutionally, quitting would only feed it. Quitting would undermine the independence of the next Governor too. This did not seem the most likely scenario to us. The same is true of Yellen. Some still think that if Trump wins, he will fire Yellen. The US Presidency is a powerful office, but not unchecked. It is beyond the President's authority to fire the Fed Chair. Of course, she could quit, but that would do more to undermine the independence of the Fed more than Trump's campaign rhetoric.